This is one of my favourite frangipanis and another photo out of my archives. I purchased this variety in November last year when Lisa and I visited Frangipani Heaven – aka, the Sunshine Coast Frangipani Farm. This photo, however, was taken in February and hits all three options for Becky’s ‘In the Pink’ Square in September photo challenge – it’s pink, it’s in prime condition and I was more than ‘tickled pink’ to have my little cutting blooming so soon. Frangipani’s scientific name is Plumeria and it is a genus of flowering plants in the dogbane family, Apocynaceae. 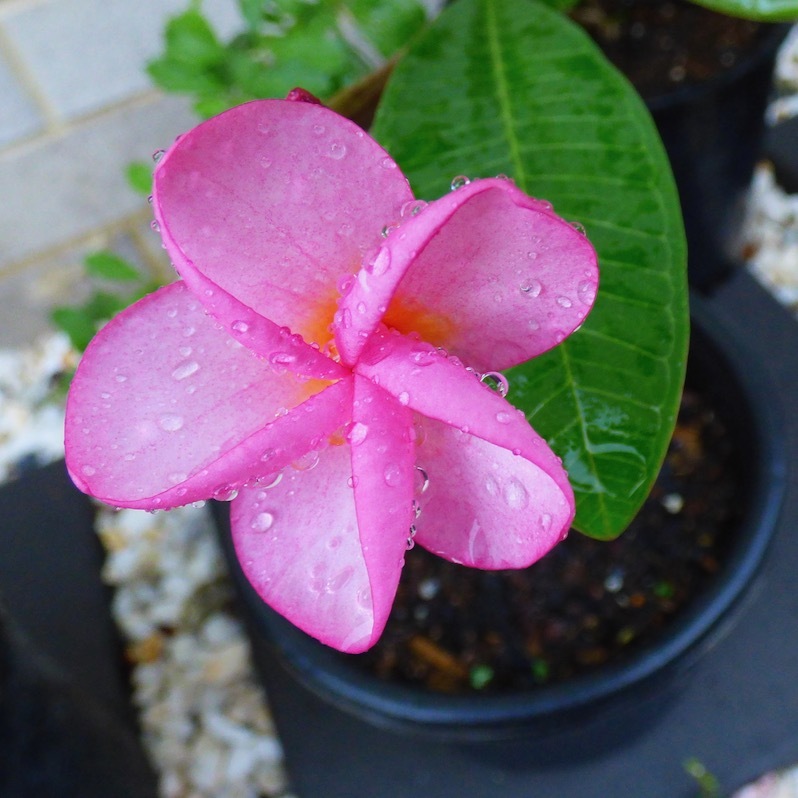 Plumeria is the name used in horticulture and the genus was named in honour of Charles Plumier, a seventeenth-century French botanist who travelled to the New World documenting many plant and animal species. One Mercutio Frangipani, who lived in 1493, was a famous botanist and traveller, famous as being one of the Columbus expedition when they visited the West India Islands. The sailors, as they approached Antigua, discovered a delicious fragrance in the air. This Mercutio told them, must be derived from sweet-smelling flowers. On landing they found vast quantities of the Plumiera Alba, in full bloom, rendering the air redolent with rich odor, and from this plant, which the present inhabitants of Antigua call the Frangipani flower, is distilled that exquisite fragrance which is now so popular in fashionable circles. The things you learn when surfing the net. I prefer the name Frangipani and most varieties are deciduous shrubs or small trees that tend to grow as wide as they do tall. They have large, dark green leathery leaves with a prominent midrib, but are known for their beautiful, attractive flowers that are clustered at the tip of the branches and emerge in Spring before the leaves appear. No to be bragging or anything, but with the days becoming noticeably warmer, new growth is finally appearing on all my frangipanis following their Winter dormancy and a flower cluster has commenced emerging on this gorgeous Watermelon variety. I can hardly wait to see this flower again. There is nothing else quite like the look or smell of the Frangipani for evoking that tropical feeling. Perhaps Hibiscus comes in a close second, but the veritable beauty of the Frangipani have made them loved around the world. From Hawaiian leis to bridal bouquets, the blooms look sensational and summer wouldn’t be the same without trees laden with flowers, their sweet perfume an absolute pleasure to the senses. I was so tired after work yesterday that I failed to return to my desk to review this post and hit the publish button. Therefore, because I’m now a day behind, I’ll be back ‘In the Pink’ for Square in September again this afternoon. * The full title of Piesse’s book is – “The Art of Perfumery and the Methods of Obtaining the Odors of Plants: With Instructions for the Manufacture of Perfumes for the Handkerchief, Scented Powders, Odorous Vinegars, Dentifrices, Pomatums, Cosmetics, Perfumed Soap, Etc., to which is Added an Appendix on Preparing Artificial Fruit-essences, Etc”. Wow! The book was published in 1876 and you can obtain a free copy here. It is, isn’t it? And the reason I had to buy a cutting. Flowering season – end of Winter. Both equally welcome in my books right now.